"While the Masonic Lodge may call it 'The Temple of Solomon,' if their story about its building is false, then Freemasonry is presenting another temple. They can argue symbology all they want, but if the story is false, then what it symbolizes is also false, for there is nothing of any real substance for the symbol to represent." Satan always hides behind a facade; and he does not need a password or dues card to enter the lodge in order to grip the hearts and minds of Masons. Since this is true, it is of utmost importance for us to discern how the devil has used Freemasonry to distort the Biblical record. Satan is not interested in destroying other faiths; he already knows that they are counterfeit. He only cares about deceiving Christians, hence the use of Bible "scripture twisting" in Freemasonry, which is one of Satan's craftiest works of art. Rather than using the bogus "Volumes of Sacred Law" of other religions, Freemasonry uses the real thing – the true inspired Word of God – the Holy Bible. Freemasonry takes the actual biblical account of the building of God's Temple and twists the facts in order to fabricate its Masonic Legend used in its ritual. Masons say it is just a fable or allegory to teach a deeper truth. Certainly figures of speech, parables and metaphors are part of human communication and help to illustrate a point in the context of a real issue. However, the Legend in Freemasonry is not the same thing. It is not a fable in the purest sense of the word that is, standing alone in and of itself in order to convey its deeper meaning. It would be purely fable if it were separated from Scripture, and did not include any biblical characters. But because it integrates God's pure Word (which is fact) with fiction, it distorts the truth contained therein. As a result, since most Masons don't even read the Bible, many think that the Legend is true, even though they may be told that it is not. This is why many Masons think that King Solomon was really Freemasonry's first Worshipful Master and that the Temple he built was indeed the first Masonic Lodge and that the inner sanctum was for the "Masons" of that time, rather than the Levitical Priests as the Bible teaches. By the same token, there are some Masons who have postulated that, John the Baptist was a Mason, since he wore an animal skin "apron." And, believe it or not, other Masons have even confused Jesus' operative profession as a carpenter into wrongly concluding that he too may have been a member of their speculative craft. Please, give me a break! You see, this is the danger of the Masonic Legend. Because it integrates the real historic events found in God's Word with the fairy tale of Masonic ritual, it ultimately distorts the truth of God and causes men to think the nonsense just described. "Thus all the work that Solomon made for the house of the LORD was finished: and Solomon brought in all the things that David his father had dedicated; and the silver, and the gold, and all the instruments, put he among the treasures of the house of God. Then Solomon assembled the elders of Israel, and all the heads of the tribes, the chief of the fathers of the children of Israel, unto Jerusalem, to bring up the ark of the covenant of the LORD out of the city of David, which is Zion. Wherefore all the men of Israel assembled themselves unto the king in the feast which was in the seventh month. And all the elders of Israel came; and the Levites took up the ark. And they brought up the ark, and the tabernacle of the congregation, and all the holy vessels that were in the tabernacle, these did the priests and the Levites bring up. Also king Solomon, and all the congregation of Israel that were assembled unto him before the ark, sacrificed sheep and oxen, which could not be told nor numbered for multitude. And the priests brought in the ark of the covenant of the LORD unto his place, to the oracle of the house, into the most holy place, even under the wings of the cherubim: for the cherubim spread forth their wings over the place of the ark, and the cherubim covered the ark and the staves thereof above." Solomon continues, "And they drew out the staves of the ark, that the ends of the staves were seen from the ark before the oracle; but they were not seen without. And there it is unto this day. There was nothing in the ark save the two tables which Moses put therein at Horeb, when the LORD made a covenant with the children of Israel, when they came out of Egypt. And it came to pass, when the priests were come out of the holy place: (for all the priests that were present were sanctified, and did not then wait by course: also the Levites which were the singers, all of them of Asaph, of Heman, of Jeduthun, with their sons and their brethren, being arrayed in white linen, having cymbals and psalteries and harps, stood at the east end of the altar, and with them an hundred and twenty priests sounding with trumpets:) it came even to pass, as the trumpeters and singers were as one, to make one sound to be heard in praising and thanking the LORD; and when they lifted up their voice with the trumpets and cymbals and instruments of music, and praised the LORD, saying, For he is good; for his mercy endureth for ever: that then the house was filled with a cloud, even the house of the LORD; so that the priests could not stand to minister by reason of the cloud: for the glory of the LORD had filled the house of God." The forerunner to Solomon's temple was the tabernacle, a tent which God instructed Moses and the Israelites to build while they were at Mount Sinai in the wilderness. God gave specific instructions as to how the tabernacle should be constructed, and how each of the vessels and furnishings should be fashioned and ornamented (Exodus 25-40). The tabernacle was designed to be taken down quickly, and each of the furnishings was equipped with rings through which poles could be placed for transporting. This "portable" sanctuary was used by the people of Israel as they traveled through the wilderness until they finally reached the promised land of Canaan, after which the tabernacle was set up permanently. It was used until the time of Solomon who built a glorious temple for God to dwell in, fulfilling the dream of his father David. During the era of the kings, the temple went through several periods of defilement and restoration. It was ransacked by Shishak of Egypt during King Rehoboam's reign, and was later restored by King Asa (2 Chronicles 12:9, 2 Chronicles 15:8, 2 Chronicles 15:18). After another period of spiritual decline and idolatry, King Joash repaired and restored the temple (2 Chronicles 24:4-14). King Ahaz gave several of the temple furnishings to the King of Assyria as a gift and closed the temple. His son Hezekiah reopened the temple and repaired and cleansed it. However, Hezekiah's son Manasseh would defile the temple again with idolatrous practices. These practices continued through Manasseh's successors until the temple was destroyed by King Nebuchadnezzer of Babylon (2 Chronicles 28:21-24, 2 Chronicles 29:1-19, 2 Chronicles 33:1-7, 2 Chronicles 34:1-13, 2 Chronicles 36:18-19). Fifty years after Nebuchadnezzer destroyed the temple, King Cyrus allowed the Israelites to return from exile in Babylon to Palestine and rebuild the temple under the leadership of Zerubbabel (Ezra 1:1-4; Ezra 3:8). There was opposition to the rebuilding of the temple from other inhabitants in the area. This caused a delay of around 10-15 years. Under the stirring of the prophets Zechariah and Haggai, temple restoration continued till completion and dedication around 516 B.C. This second temple was smaller and less ornate than its predecessor. Much expansion and restoration, spanning 46 years, was done to the temple by King Herod during the time of Jesus, which is referenced in John 2:20. It is this temple which Jesus visited as a child with Mary and Joseph to celebrate the annual Passover feast. And it is this temple from which He would expel the moneychangers. The early Church gathered at this temple to worship, God used Peter to heal a man at the temple's gate, and Paul was physically accosted and accused of defiling the temple by bring Gentiles into the inner court. Jesus prophesied the temple's destruction, "There shall not be left here one stone upon another that shall not be thrown down." (Matthew 25:1-2). This was fulfilled by the Roman military under the leadership of Titus in 70 A.D. who destroyed, not only the temple, but most of Jerusalem as well. Biblical prophecies mention a time in the future when the Antichrist will desolate the temple and stop the sacrifices offered. Because of these prophecies, Israel must sometime in the future rebuild the temple and start offering sacrifices once again. Plans are already being drawn up to rebuild the temple and to fashion its furnishings. The tabernacle and temple in the Old Testament was rich in symbolism of the person and ministry of Jesus Christ, the future Messiah who would be a once and final offering and sacrifice for our sins. This would explain God's attention to detail in His instructions concerning the tabernacle's construction and the fashioning of the vessels and furnishings. The tabernacle was built with money or items willingly given from the heart (Exodus 25:2). Matthew Henry penned in his commentary, "God chose the people of Israel to be a peculiar people to himself, above all people, and he himself would be their King. He ordered a royal palace to be set up among them for himself, called a sanctuary, or holy place, or habitation. There he showed his presence among them. And because in the wilderness they dwelt in tents, this royal palace was ordered to be a tabernacle, that it might move with them. The people were to furnish Moses with the materials, by their own free will. The best use we can make of our worldly wealth, is to honor God with it in works of piety and charity. We should ask, not only, what must we do? But, what may we do for God? Whatever they gave, they must give it cheerfully, not grudgingly, for God loves a cheerful giver, (2 Corinthians 9:7). What is laid out in the service of God, we must reckon well bestowed; and whatsoever is done in God's service, must be done by his direction." The tabernacle and its furnishings have great symbolic and theological significance. The tabernacle showed God's willingness and desire to meet with mankind, and ultimately foreshadow the coming of Jesus, who "became flesh and dwelt among us." (John 1:14). 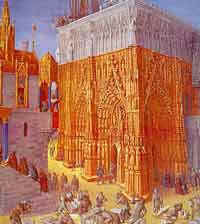 The symbolism is expressed in the Old Testament references to the tabernacle as the "tent of meeting". The very first tent of meeting was a small tent erected outside of the camp of Israel where Moses would go to meet with God. The pillar of fire and cloud, which was a visual sign of God's Presence, hung over the tent. The people of Israel were invited to come to the tent to inquire of the Lord, but only Moses could enter. When the tabernacle was constructed, the pillar of fire and cloud moved from Moses' tent to the tabernacle, signaling it as God's new place of dwelling and meeting with man. Though the tabernacle itself is symbolic of God's desire to meet with man, each of the furnishings and rituals also has great symbolism. God gave specific instructions to Moses to construct everything "according to the pattern shown you on the mountain." (Exodus 25:40). The writer of Hebrews expressed the tabernacle's symbolism, calling it "a copy and shadow of what is in heaven." (Hebrews 8:5). There was only one entrance into the tabernacle (on the east side), which symbolized Jesus as being the only way to God. "I am the way, the truth, and the life," Jesus said, "no man cometh unto the Father, but by me." (John 14:6). Jesus also referred to Himself as the door: "I am the door: by me if any shall enter in, he shall be saved" (John 10:9). Once through the door and into the outer court, one came upon the altar of burnt offering, which symbolized not only God's judgment of sin, but also His willingness to accept a substitutional sacrifice. Also in the outer court was the brazen laver or basin where the priests would wash themselves before and after offering the sacrifice. The purely New Testament doctrine of water baptism may have originated in the ceremonial washing of the priests: one was not ready for service until he had been washed. Beyond the laver and the altar was the Most Holy Place, a separate tent divided into two rooms, where only the priests could enter. Walking into the inner court, one would see the altar of incense. Its fragrance and smoke, which filled the room, represents the prayers of the people always going up before God. It reminds us of Paul's words to the Thessalonians, "Pray without ceasing." One would also see the table of shewbread, which symbolized Jesus who said, "I am the bread of life: he that cometh to me shall never hunger; and he that believeth on me shall never thirst." (John 6:35). It also symbolized fellowship, and God's desire to satisfy our spiritual hunger. The bread was to be replaced every Sabbath by the priests. Also in the inner court was the golden lamp stand. The lamp stand was made of one solid piece of gold. This is a clear representation of Christ, whose bones were not broken during His crucifixion. "I am the light of the world," Jesus spake concerning Himself, "he that followeth me shall not walk in darkness, but shall have the light of life." (John 8:12). The lamp stand was to always be lit, and it was the priests' responsibility to make sure the light never went out. A veil separated the Most Holy Place from the other room, the Holy of Holies, where God did symbolically dwell. Only the High Priest could enter this room, and only on the Day of Atonement. Inside was the Ark of the Covenant where the High Priest would sprinkle blood upon the mercy seat. Inside of the ark were representations of God's dealing with man: the stone tablets containing the Ten Commandments (God's law), a pot of manna (God's provision of daily bread), and Aaron's rod which budded and brought forth almonds (God's choosing Aaron and his lineage for the priesthood). The veil reminded us of our sinful state, and that "all have sinned and fallen short of the glory of God." (Romans 3:23). But the veil which separated the two rooms was miraculously torn in half from top to bottom when Jesus died, opening the way for all to "come boldly before the throne of grace." (Matthew 27:51, Hebrews 4:16, Hebrews 7:25). The veil of the temple was about 80 feet or 25 meters in height, and such a large piece of material was probably quite heavy. No human could have torn it, especially from top to bottom. Thus, God tore down the barrier between us and Himself, allowing mankind full access to Himself. The writer of Hebrews tells us, "Having therefore, brethren, boldness to enter into the holiest by the blood of Jesus, by a new and living way, which he hath consecrated for us, through the veil, that is to say, his flesh; and having an high priest over the house of God; let us draw near with a true heart in full assurance of faith, having our hearts sprinkled from an evil conscience, and our bodies washed with pure water." (Hebrews 10:19-22). The Ark of the Covenant, the only furnishing in the Holy of Holies, was covered with the mercy seat upon which the High Priest would sprinkle the blood. On each end of the ark were two golden cherubim, facing each other, and looking down upon the mercy seat where the blood would be applied. It is between the two cherubim that God would manifest His presence. It is interesting indeed, when reading the account of Jesus' resurrection in the book of John, that Mary Magdalene looked into the tomb to see two cherubim sitting where Jesus' body had lain, one at the HEAD and one at the FEET (John 20:12). Between the two cherubim was where the supreme sacrifice, once and for all, was laid. The ark and the veil together spoke to mankind, "You are welcome, but you can only come so far, and no farther." Instead of a flaming sword to keep men out, now the cherubim proclaim, "He is not here, He is risen." And now all who will may come and take the water of life freely! The sacrifices made daily in the temple could not take away our sins, but only cover them. The writer of Hebrews said of Christ, "For the law having a shadow of good things to come, and not the very image of the things, can never with those sacrifices which they offered year by year continually make the comers thereunto perfect. For then would they not have ceased to be offered? ...And every priest standeth daily ministering and offering oftentimes the same sacrifices, which can never take away sins: but (Jesus), after he had offered one sacrifice for sins forever, sat down on the right hand of God." (Hebrews 10:1-2, 11-12). Matthew Henry voiced in his commentary, "The apostle having shown that the tabernacle, and ordinances of the covenant of Sinai, were only emblems and types of the gospel, concludes that the sacrifices the high priests offered continually, could not make the worshippers perfect, with respect to pardon, and the purifying of their consciences. But when "God manifested in the flesh," became the sacrifice, and his death upon the accursed tree the ransom, then the Sufferer being of infinite worth, his free-will sufferings were of infinite value. The atoning sacrifice must be one capable of consenting, and must of his own will place himself in the sinner's stead: Christ did so. The fountain of all that Christ has done for his people, is the sovereign will and grace of God. The righteousness brought in, and the sacrifice once offered by Christ, are of eternal power, and his salvation shall never be done away. They are of power to make all the comers thereunto perfect; they derive from the atoning blood, strength and motives for obedience, and inward comfort." The tabernacle was a sanctuary, a place sanctified and set apart for God to dwell among His people and to meet with them. 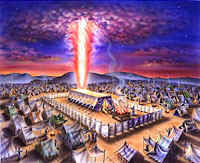 The glory of God, like a cloud, was over the tabernacle night and day. When the glory of God moved, the people of Israel would pack their belongings and move also, following God as He led them. The tabernacle was a testimony, for contained within the Ark were the Ten Commandments, a constant reminder of God's holiness and His laws for living. Following God could not be separated from following His laws. Also within the Ark was a pot of manna, representing God's supernatural provision for His children. God's lesson for the children of Israel, as well as us, is that He will provide our needs daily, and not to worry about tomorrow. Jesus echoed this thought in His teaching, "Seek ye first the kingdom of God, and all these things will be added unto you." The tabernacle was a place of forgiveness, for the sins of the people were atoned for through the sacrifices of spotless lambs and bullocks. While the blood of lambs covered their sin, it symbolized Jesus, the Lamb of God, who would take away their sin, and our sin. The writer of Hebrews penned, "But Christ being come an high priest of good things to come, by a greater and more perfect tabernacle, not made with hands, that is to say, not of this building; neither by the blood of goats and calves, but by his own blood he entered in once into the holy place, having obtained eternal redemption for us." (Hebrews 9:11-12). The tabernacle pointed toward New Testament believers, who would become the dwelling place of the Spirit of God. Paul expressed this to the church at Corinth, "Know ye not that your body is the temple of the Holy Ghost, which is in you, which ye have of God, and ye are not your own?" (1 Corinthians 6:19). As God dwelt in the Holy of Holies, so each Christian as the temple of the Spirit is instructed to walk in holiness, "without which no man shall see the Lord." The veil of the temple, which visually separated God from man, would be torn in half from top to bottom when Christ, opening the way for men to "come boldly unto the throne of grace, that we may obtain mercy, and find grace to help in time of need." (Hebrews 4:16). The tabernacle pointed toward heaven and man's final redemption, "for Christ is not entered into the holy places made with hands, which are the figures of the true," the writer of Hebrews said, "but unto heaven itself, now to appear in the presence of God for us." (Hebrews 9:24). The apostle John, during the great Revelation of Jesus, saw a new heaven and earth, and a New Jerusalem coming down from God out of heaven. Then he heard a great voice proclaim, "Behold, the tabernacle of God is with men, and he will dwell with them, and they shall be his people, and God himself shall be with them, and be their God. And God shall wipe away all tears from their eyes; and their shall be no more death, neither sorrow, nor crying, neither shall there be any more pain: for the former things are passed away. And he that sat upon the throne said, Behold, I make all things news. And he said unto me, Write: for these things are true and faithful." (Revelation 21:1-5). The Temple was a foreshadow of Christ and His redemptive and sacrificial work for mankind, as well as symbolic of God's presence among men. As Christians, our own bodies are now the temple of the Holy Spirit, for which reason the apostle Paul warns us so strongly against immorality and impurity. Jesus came as "The Word made flesh and dwelt among us", and has promised that He would never leave us nor forsake us. The New Jerusalem which God is preparing for us will contain no temple. John the Apostle said in the book of Revelation, "And I saw no temple therein: for the Lord God Almighty and the Lamb are the temple of it."